Interesting interview. Smits sounds like the politician (which he he is), but he does not sound as a politician bothered about elections and his electorate. Smits' answer to concerns raised by Kamerlin et al on my site reads to me as if he decided that the majority of researchers is already behind his Plan S (or rather, will not dare to protest), so he gives Kamerlin and her colleagues a chance to see the error of their ways, apologize for being wrong and toe the Party line. The rest of interview is not much better. His cold-hearted attitude to the soon-to-be-excluded global South is a bit unsettling, but maybe Smits had some bad curry. Maybe Richard can get to interview (again) the other likely architect of Plan S, Kamila Markram of Frontiers? She is quite eloquent, in her own scary way. But at least the European scientists will know what future awaits them. I want to clarify a bit about the claim that Plan S is unethical. I am speaking here for myself only and not for the co-authors of the piece cited here that's posted on the "For Better Science" blog. Since I was the one who suggested the word, though, I feel a certain responsibility to clarify what I meant. As far as I am concerned, the words 'is unethical' could be removed and replaced with the words 'infringes on academic freedom'. When I said Plan S is unethical, that's all I meant. I tried to clarify that here: https://jbrittholbrook.com/2018/09/18/whats-unethical-about-plan-s/. 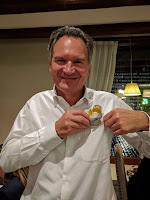 After meeting with Robert-Jan Smits in person, and with Marc Schilz joining via telephone, I realized that they had taken the term 'unethical' in a different, colloquial, way -- as if we had been accusing them personally of some sort of corruption. I then issued an apology here: https://jbrittholbrook.com/2018/09/18/whats-unethical-about-plan-s/#comment-5538. I stand by my apology. I never meant to accuse anyone of corruption. I also stand by my argument that Plan S impinges on academic freedom. For more on the latter, see: https://jbrittholbrook.com/2018/10/01/on-academic-freedom-and-responsibility/. Well I don't know. Is having a Holtzbrinck-owned for-profit publisher which parades its impact factors around, as your key partner when making and announcing Plan S, ethical? Main problems of plan S is about the long-term targets which are not clear. Is it just about relocation of funding in the publishing related to APC? If it is, all those companies which initiated and strongly support it like Hindawi and some other OASPS member should announce if they expect to get to this funding too. They are commercial publishers, so their plans should be disclosed to the public. If it is about open access itself, so they should announce their forecasts how this plan S will influence the dynamics of movement to open access worldwide. Third, if Plan S is a regional initiative and concerns just EUROPE what is the motive of international OA players to declare about support of plan S before discussing this issue with oversea players like APA or STM. I expect that Hindawi and OASPA knew about such negative attitude of APA and STM to plan S far before, and now they try to use this negative attitude against APA and STM considering them as competitors. It is not good case when such good idea as OA is used in such manner. A wide public dialog should have been before issuing this initiative (Plan S) in September. This would unite larger players - APA, STM and OASPA. Now, we see that STM and APA are united against this plan. OASPA is driven by e few Publishers from inside and takes an opposite side to STM and APA. To find a true story of origin of Plan S Richard should have the same interview with Frontier, which, likely, inspired Smits to move it forward. I feel the same - Smits responds in the way to keep some questions not answered, probably. Was Frontier alone in promoting this idea to Smits, or probably, Frontier represented a group of other interested parties (Publishers) and who are they? If it is, who are these Publishers? It seems to me that in any way they truly forget about scholars? By the way, does Smits have a scholarly experience? If he has not, Leonid is right - Smits acts like a politician, and Plan S is about politics, bot about science. I expect that during 2019 we will know even more interesting, unknown now, issues related to above.